Gov. Asa Hutchinson outlining the new highway plan. A renewal of the existing half cent sales tax on fuel funds more than two thirds of a $300 million highway funding plan, the largest amount of increased annual revenue to state highways in the state’s history. Gov. Asa Hutchinson says this proposed plan gives the most funding, he feels, the state can afford. "This plan, achieves the right balance. It is affordable, it is prudent for our budget and it is reasonable," Hutchinson said. The plan, proposed Monday by Hutchinson and legislative leaders, consists of over $205 million from the gas tax, as well as $95 million in additional funding. The gas tax, first passed in 2012, would need voter approval in 2020, after legislators vote to place the amendment on the ballot this year. According to Hutchinson, Arkansas would gain $205,590 million a year through the gas tax. Additionally, counties and cities would get over $44 million annually. 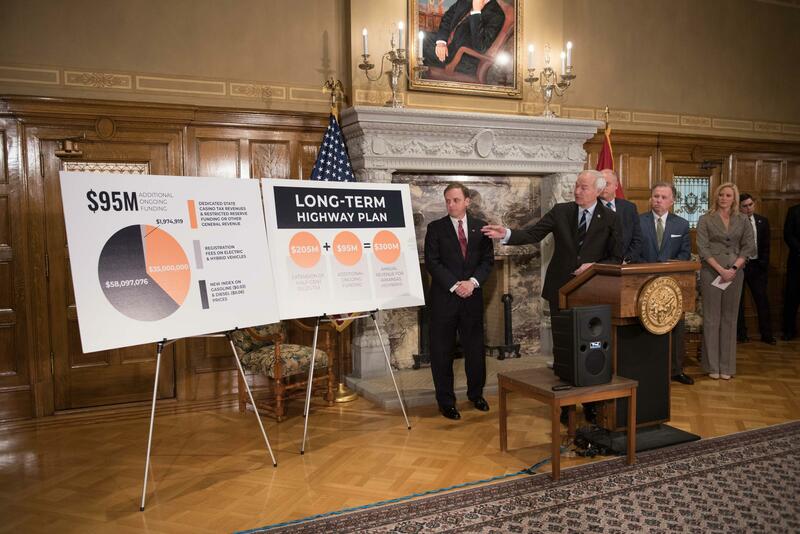 Scott Bennett, director of the Arkansas Department of Transportation, approves of the plan, saying the $300 million was one of the targeted amounts the department believed could "really do a lot of good for improving highways around the state." He believes voters will approve of the gas tax. "I think polling has shown that the people are in favor of it, and all of the work that we’ve done around the state in communicating our needs to people have shown that they are in favor of it," Bennett said. A breakdown of the $95 million that will not come from the fuel tax. Additional legislation would be necessary to fund the remaining $95 million dollars. The plan breaks down this funding into three parts. The first part consists of a new tax index for diesel and gasoline. The new tax rates would be 24.5 cents and 28.5 cents per gallon. This increase would amount to a 3 cent raise in the gas tax and 6 cent increase for diesel at the retail level, and would ultimately bring in $58 million dollars annually. Hutchinson says this increase will minimally affect motorists. "This is limited to one-tenth of one cent every year. And so with that kind of limitation, you can see that it is a technical indexing. It’s indexing, but it is such a small amount that it should not have an adverse impact on the motorist," Hutchinson said. This tax increase would only require a simple majority in both chambers. An increase in the registration fees for electric and hybrid cars make up the second part of the $95 million dollar funding plan. Owners of electric cars would pay an additional $200 to register their vehicle, while hybrid car owners would pay an additional $100. Hutchinson said these fees would make up for money not spent on fuel. "This is logical because we are taxing those that are running on diesel and gas for our highways and the growing element of electric and hybrid cars are not paying the same amount because they are not acquiring the same amount of gasoline," Hutchinson said. The additional registration fees should add up to almost $2 million a year. 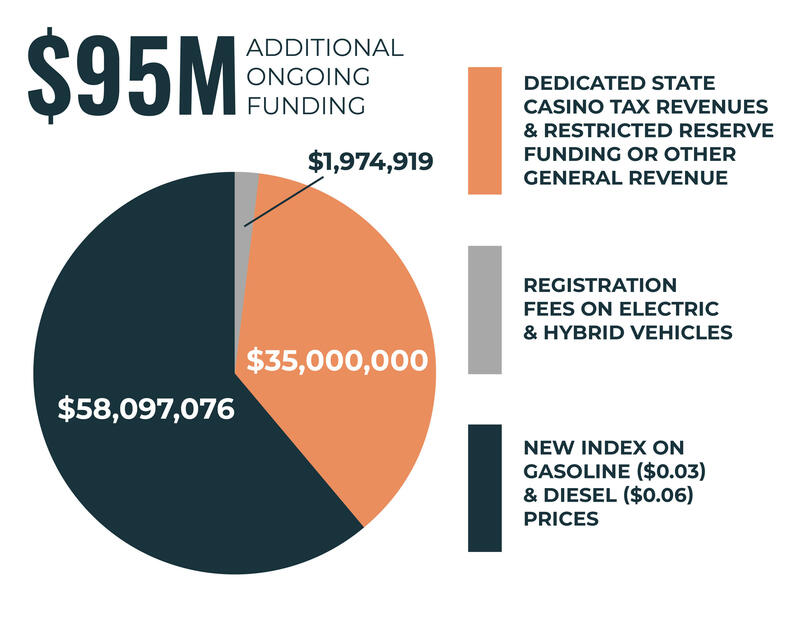 Finally, tax revenues from casinos, restricted reserve funds and the use of other funding from general revenue make up the remaining $35 million. According to Hutchinson, Arkansas currently earns $31.2 million in revenue each year from the gaming industry. With the recent voter-approved expansion, they expect additional funds from those casinos "over and above" what the state receives already. That new revenue will go towards the highway department. While it is a historic plan in terms of funding amount, Hutchinson said it will not reduce the general revenue funding available for education or other matters. "It is designed not to jeopardize the general revenue funds that are critical for K-12 education, higher education and the other needs of our state including public safety," Hutchinson said. "So it’s a balanced plan that does not harm us in terms of our education and the primary needs of our state." Senate President Pro-Tem Jim Hendren, R-Gravette, spoke on the plan as it related to the tax cut bill that initially failed in the Senate before passing a day later. He said there were many senators that had concerns about the tax cuts and how they would affect highway funding. Hendren believes those concerns are valid and hopes the proposed highway plan alleviates those concerns. "I want to again commend those in the House who have the same concerns. It is a legitimate request to say 'How are we going to fund highways as we begin to put our budget together with regard to tax cuts?' and I think what you see here today is the answer to that question," Hendren said. House Speaker Matthew Shepherd, R-El Dorado, says he believes the plan will pass in the legislature. "Ultimately, we’re confident we’ll be able to get the votes, but we still have to make the case to the membership and answer their questions and allow them the opportunity to vet the proposal," Shepherd said. Rep. Megan Godfrey, D-Springdale, says she likes the plan, but will be looking carefully at where the money from general revenue will be coming from. "There’s a lot about this plan that we like. There are a lot of areas of focus that are important to us as well and seeing the focus on infrastructure and investing in it is important to us. I think that piece on making sure that none of our services, particularly education are touched by general revenue is what we have the most questions about," Godfrey said. If the plan does exactly what it says it will do, Godfrey said she gives it a "thumbs up." An Arkansas lawmaker has proposed tapping into tax revenue from car sales and imposing a new tax on motor fuels to raise money for the state's highways, combining two approaches that have faced significant opposition in the predominantly Republican Legislature. Republican Rep. Dan Douglas filed a bill Monday that he said he hoped would start the conversation on highway funding, which legislative leaders and Gov. Asa Hutchinson have called a priority for this year's session.